Pick-up time is between 9.00 and 10.00 daily. We are comparing Cooking Class and Lunch at a Tuscan Farmhouse Prices from leading ticket suppliers and Try to find you Cheap tickets prices on the market. While in Tuscany why not take a day out of Florence to visit some of the wonderful Italian countrysides. This half-day trip takes you from Central Florence to a rural farmhouse where you will learn to cook delicious Tuscan dishes which are sure to impress at your next dinner party. This is a leisurely experience so take a break to taste your foods and sample regional Chianti before cracking on with the main course of roast pork and tiramisu for dessert. After dining you'll be driven back to Central Florence, you'll get to keep your apron as a souvenir of the Tuscan cooking class. On the way to the farmhouse you may visit the Mercato Centrale in Central Florence or stop in the village of San Lorenzo to see the historical food market and collect fresh ingredients. This full day excursion if for people with a passion for food. Whether you're planning a fancy dinner party or just looking to recreate some of your favourite foods. Suitable for individual travellers and small groups. Your Experience With Cooking Class and Lunch at a Tuscan Farmhouse? Take a trip to the scenic Tuscan countryside and learn to cook some of your favourite Italian dishes. Enjoy a traditional 4-course dinner (prepared by you) with regional wines on an authentic Tuscan farm. Visit a farmers market in a Tuscan village or tour the vegetable patch at the farmhouse. What Cooking Class and Lunch at a Tuscan Farmhouse Includes? Round trip private transport from Central Florence. 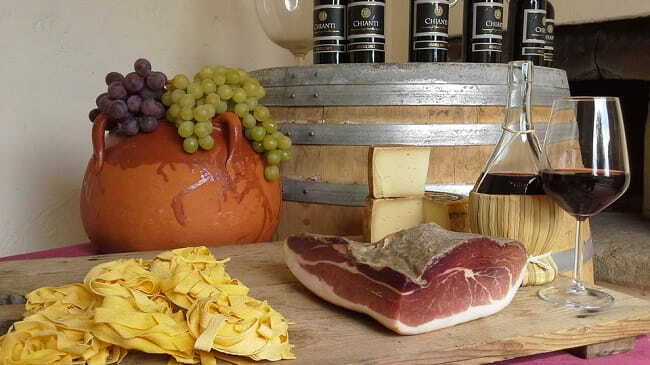 Interactive cooking class, 4 course traditional Tuscan dinner and regional wine tasting. To avoid any problems we recommend that you advise you tour supplier of any dietary requirements in advance of the tour. Pay attention at the market so that you can pop back on your own after the tour. Travelers Reviews about Cooking Class and Lunch at a Tuscan Farmhouse? The Tuscan Cooking Class has full 5 out of 5-star reviews from thousands of travellers who have reviewed the tour on Viator and TripAdvisor. Get Your Guide has an average score of 3.3-stars but has only a handful of customer reviews. Comments generally agree that this is an excellent and well-organized day trip. Travellers say that the location and cooking facilities were brilliant. Not practical for wheelchairs or those with walking difficulties. Mobile or paper vouchers are accepted. You may receive a refund for cancellations made up to 24 hours prior to tour date, however this depends on individual suppliers policy. A minimum of 2 participants is required. Under 12's are not permitted and under 18's must be accompanied by an adult. Menu may change, vegetarians and other dietary requirements cannot be catered for. Pick-up Point: Opposite Santa Maria Novella Train Station, Central Florence.